Originally Published in the November 2007 issue of "AOPA Pilot"
Meadow Lake Airport, located in the shadow of Pike's Peak, about 15 miles to the northeast of City of Colorado Springs Municipal Airport in Colorado, and about 20 miles from the Air Force Academy, is one of the largest pilot-owned airports in the United States. With over 450 aircraft based there, it is a hub of general aviation activity in the region, relieving operational pressure from the air traffic controllers at both Denver International and the Colorado Springs Airports. Several Fixed Base Operators (FBOs) also call the field their home, among them are Classic Air, which primarily rents Piper airplanes to flight students and pilots, and American Aviation, which rents mostly Cessna airplanes. Brookham was no novice to flight. A graduate of Aviation High School in Redondo Beach, California (a bit of a misnomer, as the school’s name referred not to flying, but rather the road on which it was located), Brookham’s desire to fly was sparked when he was enlisted in the United States Navy. There, aboard the aircraft carrier USS Hancock, he served as a plane captain on the ship’s flight deck. After his service was complete, the “brown shirt” worked towards and completed his private pilot’s license in 1975, adding an instrument rating a few years later. From 1984 to 1995, he flew as a mountain/mission pilot for the Civil Air Patrol, with one "find" and two "saves" to his credit. He also flew skydivers for two years, flying his own Cessna 206. In the time since, he had become self-employed with his wife, Debbie, selling premium pet food, and working towards retirement. Brookham stated, "I was just trying to get the airplane down safe." He knew that there were homes in the vicinity of the airport, and didn’t want to hurt anyone. But, in the darkness, in the seconds before touchdown, as he tilted the plane’s nose downwards, he saw a frightening pairs of lights - those of an oncoming car! "Any landing you can walk away from, is a good landing," said Brookham, the Friday morning after the crash. "I don't think anything's wrong with the airplane... maybe there's something wrong with me." An examination of the Lycoming engine and its systems by investigators revealed no anomalies. However, given the conditions at the time of the flight, temperatures below freezing and high humidity, were, according to the manufacturer's carburetor icing probability chart, conducive for "serious icing at glide power" and "serious icing at cruise power." 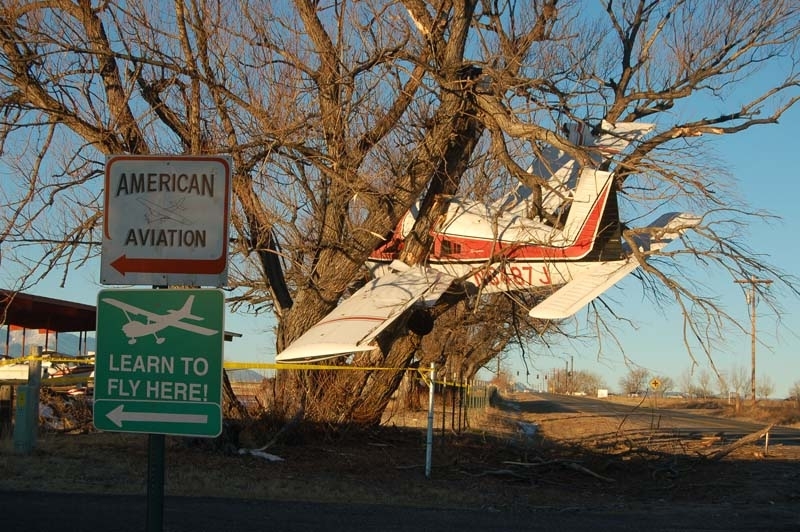 Knowing this, the National Transportation Safety Board (NTSB) concluded that the likely cause of the accident was the "loss of power due to carburetor icing", with contributing factors to the accident being weather conditions conducive to carburetor icing, unsuitable terrain available on which to make a forced landing, and, of course, the tree. One month after the accident, Terry was up and flying again. He stated that his survival might have had something to do with an angel, saying "Oh I definitely had one in the co-pilot seat, no doubt about it." He credits all the great instructors he has had over the years with helping save his life. He advises that, in the same situation, that pilots need to ride the airplane down, and keep their heads about them in the event of an emergency.